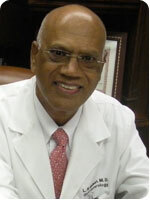 Dr. Mallaiah has been in private practice since 1981 and has been specializing in the field of gastroenterology for over 30 years. He completed his internal medicine residency training at the V.A. Medical Center (Brooklyn, NY) in 1977 and two year fellowship at the V.A. Medical Center in 1980. Board certified in Internal Medicine as well as in Gastroenterology, Dr. Mallaiah has received the honor of "Fellow of the American College of Physicians" (FACP), and "Fellow of the American Gastroenterological Association" (AGAF). Dr. Mallaiah is also a member of the Florida Medical Association, Florida Gastroenterologic Association, American Society for Gastrointestinal Endoscopy, American Gastroenterological Association, and Seminole County Medical Society.